Negroni Week Coming Up! Yay! 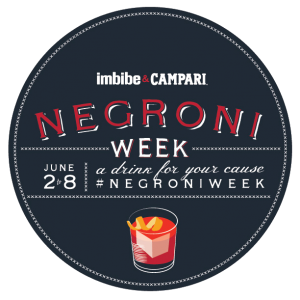 Welcome to Negroni Week, presented by Imbibe and Campari! Inspired in part by Douglas Derrick’s Negroni Social event at Nostrana in Portland, Oregon, and also a collective love of the Negroni and giving back to the community, Imbibe launched Negroni Week, a celebration of one of the world’s great cocktails and an effort to raise money for charitable causes around the world. From June 2-8, 2014, bars across the U.S. (and some around the world) will be mixing up their favorite Negroni variations and donating a portion of proceeds from each one sold to a charity of their choice. Last year, hundreds of bars participated in Negroni Week, and even more are participating this year. Click here to email us with any questions or ideas you have about getting involved. We’d love to partner with you! And keep tabs on the Negroni Week action on Imbibe’s Instagram and Twitter feeds (@imbibe) and by following the #NegroniWeek hashtag.